I think another reason pitchers have dominated this list so far, besides the fact that things will even out some later on, is that it seems to be easier to find a picture of a pitcher proudly displaying his number. With hitters, they may have their pictures taken at bat from the front or in the midst of their swing, obscuring what, for us, is a key portion of their identity. Pitchers, though, show their number proudly as they go through the motions of hurling the baseball. It’s a small thing, but it’ll tip the scales at times. Actually, though, there really aren’t any hitters that stand out in the history of #34. There are names that are familiar, such as Scott Cooper or Felix Jose or Jarrett Hoffpauir or Nick Stavinoha, but none of them are what you call memorable sluggers, people that you remember without being prompted. The list of pitchers for this number isn’t necessarily of Cooperstown caliber either, mind you, but there are some names that stand out. Probably none so much, for the children of the ’80s that are reading this post, than Mr. Cox. Cox was an integral part of those great teams under Whitey Herzog, posting an 18-9 mark in 1985 as the team went to the World Series. He continued that run into the postseason, putting up a 1.29 ERA in that World Series after beating the Dodgers in the NLCS. 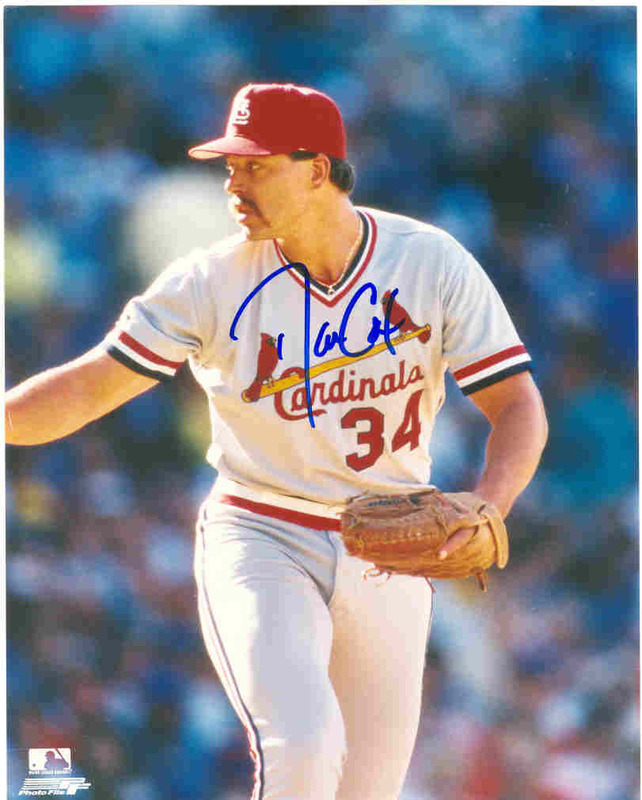 In fact, his only postseason misstep was in the 1987 Series, where Minnesota lit him up for 10 runs in 11.2 innings. He had his injury problems–he missed all of 1989 and 1990 with arm issues after being hurt in 1986 after jumping off a seawall in spring training and chipping his ankle–and never was as good as he was from 1985-1987. He’s stayed in the St. Louis area, though, managing the Gateway Grizzlies for four seasons. He’s also done many camps and such under the Arch. So while he’s never going to be a Hall of Famer, Cardinal or Cooperstown, he’s still a fond memory and a great piece of Cardinal history.